Munster coach Johann van Graan says he would welcome the Limerick hurlers into the Munster set-up in a bid to seek the marginal gains his side requires. There has been a long tradition of sports swapping ideas and theories and Munster and Ireland back Keith Earls recently went the other direction and spoke with the Limerick hurlers as they ramped up their preparations for the knock-out stages of the championship. In the past Sunday's opponents Galway opened their doors to former Connacht and Ireland player John Muldoon, while ex Connacht rugby coach Pat Lam also delivered a motivational speech to Micheál Donoghue's side. And van Graan says he is open to GAA players and coaches coming into his set-up if their input can benefit the organisation. "If someone can add and contribute to our team and our environment, I would always welcome them in here. At the end of the day, the rugby is important, but the people is the most important thing and if we can better our individuals at Munster it will be great," said van Graan. "We have had people in here over the past few weeks to come and speak to our team. I believe that is the marginal gains that you need to look for, that is why you need to build relationships across all sports." 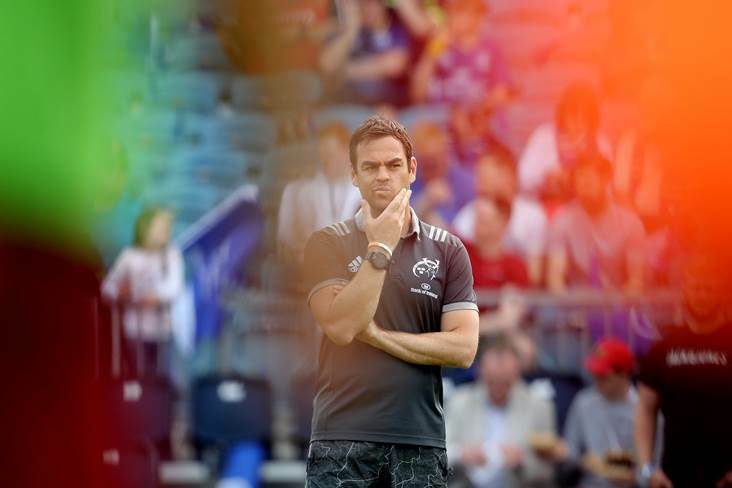 The South African native has set up base in Limerick since last November when he took over from Rassie Erasmus, and during the summer away from the game he took the opportunity to educate himself on the finer details of the local small ball game. Van Graan watched Limerick's All-Ireland semi-final victory over Cork with keen interest and he is now on the look-out for a ticket for the Croke Park decider. "That semi-final was the first game that I actually saw live, obviously on TV, and it was an incredible experience. "With Limerick being behind by seven or eight points in those last few minutes and it ending in a draw and then all of a sudden my wife and I started Googling it, you know, what's going to happen now? "It was incredible and after that I started talking to people about hurling. I think it's a sport Irish people can be very proud of. I really enjoyed it and hopefully I'll get to the final. I don't have a ticket yet but I've asked for a few tickets. "It's an incredible sport and to me, I spoke a bit with Darren Sweetnam who obviously played hurling before, just the skill level is incredible." While van Graan is backed by the trimmings of the professional game and can operate out of one of the world's leading training facilities in their University of Limerick base, he is impressed with the dedication of the amateur Limerick players. "So for somebody outside of Ireland, as a South African, to come in here, I'm used to cricket but to see a guy running with a hurling stick and catching a ball and taking it, I've really enjoyed it and admire the skill level. It's an amateur sport and the coverage it takes, you look at all the flags around, incredible really. "To see the amount that people put in for their team has been something that I admire of Irish people, not only in rugby, but in all sports. I will be cheering on the sport. "It is something I am looking to visit and to learn something from. I believe we can learn something from every single sport, so definitely it will be time well spent."